A common question asked of me is how I became an animal photographer. Although I’ve had a life long love of animals, this speciality was not in my sights at the start. I began my career as an advertising photographer specializing in table-top product photography, but slowly added larger products and automotive work to my portfolio. As my reputation for large scale subjects and productions grew, requests emerged for large animals as well. 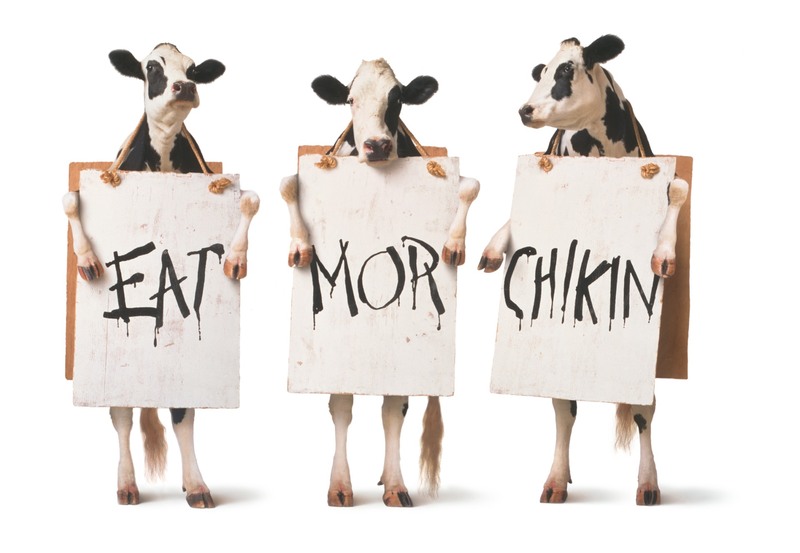 In 1995, I was hired by Chick-fil-A to produce a photograph depicting three cows wearing sandwich boards urging customers “Eat Mor Chikin”. The concept was the brainchild of Creative Director David Ring and Writer Gail Barlow of The Richards Group. The photo we created increased sales for Chick-fil-A, won numerous awards, and is still being used as an integral part of the restaurant’s markeing efforts 17 years later. For the next 5 years, I continued to photograph cows for an elaborate annual calendar produced to expand the campaign. The exposure and awards these images garnered put me firmly on the map as a go-to-guy for animal photography. In 1997, Chiat/Day Advertising, for whom we’d been shooting Nissan cars and trucks, unveiled their “Dogs Like Trucks” campaign. This image, which we shot for outdoor billboards, allowed us to combine two areas which were becoming our trademark: automotive and animals. We returned just last week from the National Dog Show in Philadelphia, and had a blast photographing the behind the scenes at a top-tier competition. I look forward to sharing some of those photos with you next month. Dang! Your photography is amazing! Gives me the chills and makes me proud to be somebody you used to know. I applaud your success. You are my favorite photographer. Congatulations on your many awards. So nice to hear from you. Thanks for your kind words.